A variable annuity, like any annuity, is a contract with an insurance company. However, in contrast to other annuity products, a variable annuity includes both a self-directed investment component and an insurance component. When you buy a fixed annuity, the insurance company invests your funds and provides you with a specific guaranteed return. With a variable annuity, you decide how the money is invested. The returns vary depending on the underlying performance of the investments you choose, which is why it's called a variable annuity. Your choices are made from a preselected list of funds, called subaccounts, inside the variable annuity, much like you would pick funds in your 401(k). Ranging from aggressive to conservative, the subaccount choices may include blue-chip stock funds, international stock funds, small-cap stock funds, various types of bond funds, precious metals, balanced funds, and money markets. Most variable annuities also have model portfolios from which you can choose. You can set up your investments so that they automatically rebalance on a predetermined schedule (such as annually or quarterly), or you can log in to your account online and redirect funds and investments as you wish. By definition, insurance company annuities have to provide some form of insurance. Most annuity contracts guarantee your initial investment will be paid out as a death benefit—meaning that, upon your death, even if your investments incur a loss, your named beneficiary gets back the original amount you invested (less any withdrawals you may have taken). This death benefit allows the annuity to qualify as an insurance contract. Since it qualifies as an insurance contract, any investment earnings are tax-deferred; in other words, you do not receive a 1099 tax form each year on interest, dividends, and capital gains from the variable annuity. Instead, you pay taxes at the time the annuity begins making payouts to you. Gains are considered to be withdrawn first, unless you annuitize your contract—that is, you trade in your lump sum of money for a guaranteed income stream from the insurance company. If you withdraw funds prior to reaching age 59½, a 10 percent early withdrawal penalty tax may apply on any portion that is attributed to investment earnings. This is the same rule as with an IRA or 401(k). Most annuities offer additional insurance benefits you can purchase, such as a death benefit rider, which can provide benefits for your heirs, and a living benefit rider, which can provide guarantees as to how much income you can withdraw from the policy at a later date. Many variable annuities also offer preferred treatment on withdrawals for long-term care expenses. These riders often come with an associated fee, however, so bear in mind you are paying to add desired benefits on to your annuity contract. 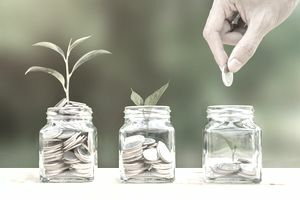 One of the touted benefits of a variable annuity is that, since you can pick your own investments, you could potentially achieve higher long-term returns than with a fixed annuity—benefiting from rises in the stock market. Of course, this feature can backfire: Your investments can also suffer from stock market declines. Also, because these contracts often come with high administrative fees, the variable annuity investments perform worse than a portfolio of index funds, in terms of overall return. Investors with long time frames (20 years or more) may benefit from using the variable annuity to hold fixed-income investments that would normally generate taxable interest income each year. Decades of tax deferral on the investment income that accumulates inside a variable annuity can make sense for those in high tax brackets now, particularly if they expect to be in a lower tax bracket later in retirement. Many folks, however, may not benefit that much from the tax deferral features of a variable annuity. While the earnings will have accumulated tax-free, when withdrawn they'll be taxed at your ordinary income tax rate, which is usually higher than regular capital gains tax rates. Seem a little complicated? It is--and that's why you should seek help from a trusted financial adviser to help you make the right choice.